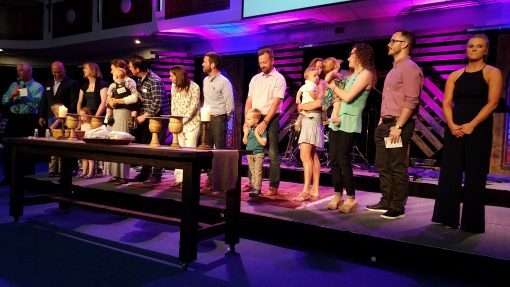 We hope that after visiting Buncombe Street, you’ll decide that you want to be a more permanent member of our church family. We believe that joining the church is good for our members and good for our church. Knowing who our members are allows us to serve them better and to plan more effectively. And becoming a member often creates a greater sense of belonging and a stronger commitment to the church and its ministries. But we want you to do more than just join the church. We want you to BE the church. We know that exciting things are happening at Buncombe Street, and we want you to be a real part of that. We encourage our new members to roll up their sleeves and get involved right away because we’re sure that our church, our community, and the members themselves will be abundantly blessed. Many of our members and friends wear Buncombe Street nametags when they’re at church or at church functions. This is one of the many things that makes a large church seem accessible to members and newcomers alike. BSUMC nametags attach with a magnet (though pin-style tags are available by request for those who have a pacemaker) and can be purchased for $6.50 each. If you would like to order a name tag, please follow the link below. I’d like to order a nametag! If you are ready to take the next step toward membership, we encourage you to sign up for our next Compass Class for new members which will be held in late March & early April 2019 from 6:00 PM to 7:30 PM. The class is offered in two sessions, with each session being offered twice. Session One will be held on Wednesday, March 27, OR Sunday, March 31. Session Two will be held on Wednesday, April 3, OR Sunday, April 7. Childcare is available for children ages 4 & under upon request. Please complete the following form in order to register for the class. Stacy Phillips in the church office will confirm your participation. Should you have immediate questions, contact Stacy at 864-371-6084. How many children (4 & under) will you bring?